A rare bottle of Glenfiddich containing malt whisky distilled in 1937 fetched a record £68,500 at auction – almost double its pre-sale high estimate. The bottle of Glenfiddich Rare Collection 1937 had been expected to sell for £25,000-35,000 when it went up for sale at Bonhams Whisky Sale in Edinburgh on Wednesday, but instead went to a bidder from the Far East for £68,500. 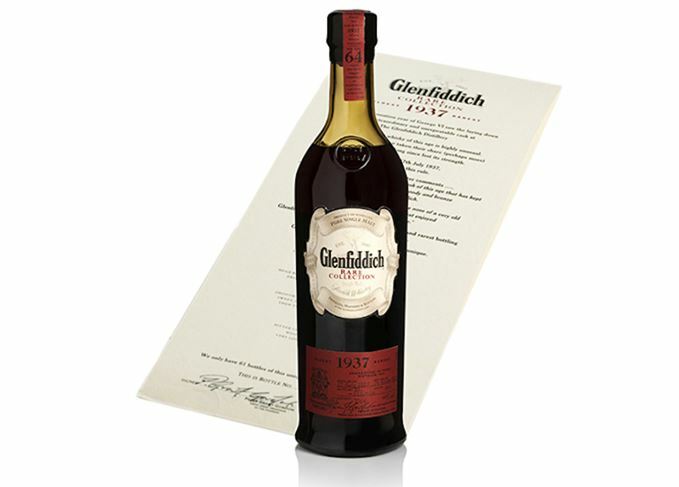 The sum is the highest price paid at auction for a bottle of Glenfiddich, and a Scottish auction house record for the sale of a single malt. The single malt was distilled and laid down in cask 843 at the Glenfiddich distillery in Speyside in 1937, and was bottled in 2001, 64 years later. The oldest and rarest expression ever released by Glenfiddich, only 61 bottles of Glenfiddich Rare Collection 1937 were released, at 40% abv. In 2012, auction house Christie’s sold one for £46,000. The Bonhams sale netted total proceeds of £310,000. The 60-year-old single malt, distilled in 1926, is expected to sell for up to £700,000. The first edition bottling is the most valuable Japanese whisky ever sold at auction. The complete set from 2001 to 2016 could fetch up to £25,000 at Bonhams in Edinburgh. Collectible Macallan, Dalmore and Ardbeg all feature in Friday’s 176-lot auction in New York.